The scientific metaphor is dangerous. We get it all the time though, so it’s something we don’t pay much attention to. But the scientific metaphor of knowledge isn’t going to work unless you have some stable quantities at some point in the operation. So a debate laboratory seems like a bad metaphor, the sort I would critique here. Stabilizing debate, however it’s done, adds elements of artificiality into the process that trade off with pedagogical value. For example, stable notions of what arguments “beat” other arguments give a sense of debate practice that just does not hold up in front of audiences, but it sure makes tournaments possible. So to call a debate conference a laboratory really surprised me. Earlier this month, I attended the debate laboratory at the University of Padua in Italy, arranged by Professor Adelino Cattani. Here the stable element was the most obvious one: What is best for the student? 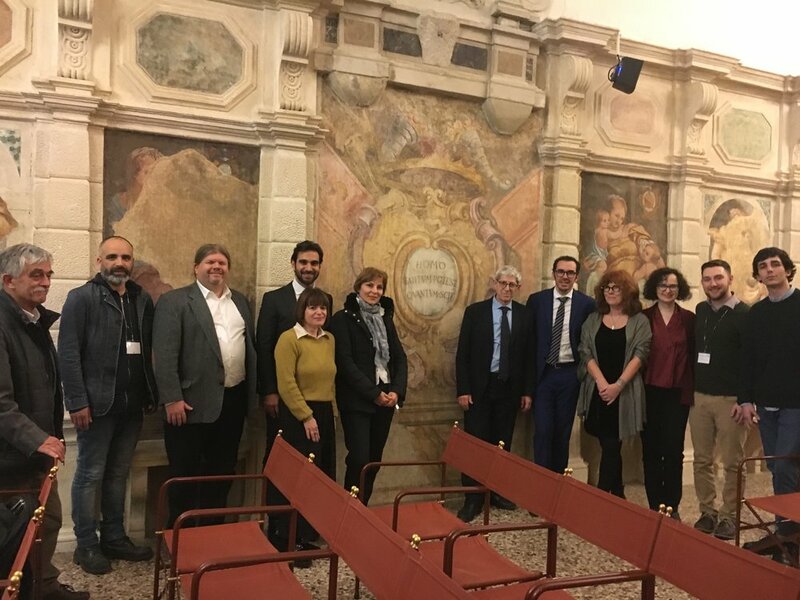 The invited speakers at the 2018 University of Padua Debate laboratory. This “best” needs some definition. Throughout the papers I heard there was a concern that debate was meant for other purposes than determining who had the best arguments or who was the best debater. Most debate practice, as demonstrated by the speakers, is aimed at improving student rhetorical ability - that is how to prepare reason, evidence, and argument for oral delivery in front of an audience where you will have live critique by an advocate for the other side at the same time. There is great value in having isolated pockets of debate practice that are internally focused. A break from my previous views so it seems. Not exactly: These practices are absent a tournament circuit where there’s a number of set, “important” tournaments to attend, and the only goal is the competition that you are having right then. It seems that keeping debate practices localized and isolated from a large competitive circuit allows you to focus on student education and to be able to assess it outside of victories. One of the best examples of the poverty of intercollegiate debate education is the lack of any other metric than tournament success to determine if debate is teaching. Focus on one element of debating practice can be intellectually rich. I was very curious what other people would talk about in Padua because the theme of the conference was judging. Can we create a good judging sheet that everyone can agree upon? I thought it was a strange topic, but I thought of an idea and wrote down some ideas I hoped were good. It turns out that this sort of focus allows for deeper and more sustained thought about a practice, one percentage of the total practice of debate that then becomes a symbol of the larger ideology operating within debating no matter how it is practiced. So far this is what I’m reflecting on. There was a time when actual teachers ran debate programs in America, and were concerned about what was happening to their students and how debate was influencing and moving their thought and reading. Today most American students’ experience in debate is a very shallow one, motivated by beating others, winning awards, and creating argument “plays” that cannot be defended against. Far away from the study of how to motivate audiences, we have intercollegiate debate that renders thought into awe and conversation into silence in the presence of the definite master of argument. Perhaps a one-day conference on the question of one argument strategy, speaker points, or judging would benefit American practices as well, by allowing us a concrete and stable place from which we can reveal some of the trappings of ideology and whether we really want them in our art.